N 26° 51' 50" and E 90° 16' 2"
Sarpang in Sarpang Dzongkhag with it's 10,416 inhabitants is located in Bhutan about 57 mi (or 91 km) south-east of Thimphu, the country's capital. Local time in Sarpang is now 11:16 PM (Sunday). The local timezone is named Asia / Thimphu with an UTC offset of 6 hours. We know of 8 airports in the wider vicinity of Sarpang. The closest is airport we know is Rupsi India Airport in India in a distance of 55 mi (or 88 km). 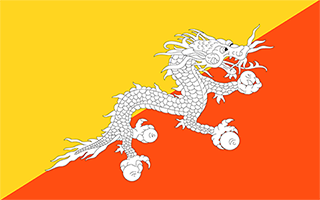 The closest airport in Bhutan is Paro Airport in a distance of 64 mi (or 88 km), South-West. Besides the airports, there are other travel options available (check left side). There is one Unesco world heritage site nearby. The closest heritage site is Manas Wildlife Sanctuary in India at a distance of 48 mi (or 77 km). Depending on your travel schedule, you might want to pay a visit to some of the following locations: Tsirang, Daga, Shemgang, Trongsa and Wangdue Phodrang. To further explore this place, just scroll down and browse the available info. Let's start with some photos from the area. Sarpang District is one of the 20 dzongkhags (districts) comprising Bhutan. Located at 26.8333, 90.25 (Lat. / Lng. ), about 2 miles away. The historic Panbari Masjid or Rangamati Masjid is a famous mosque in northeast India and is considered to be the oldest mosque in the Indian state of Assam. The mosque is situated on the National Highway 31, near Panbari and Rangamati, about 25 km east from Dhubri town. This 15th/16th century three-domed mosque also presents an excellent example of great architectural achievements of the Sultanate of Bengal. Located at 26.9, 90.3 (Lat. / Lng. ), about 3 miles away. These are some bigger and more relevant cities in the wider vivinity of Sarpang.